Winner will be announced soon! Arm parties are all over the internet right now. Blogs, twitter, instagram - there are photos of bracelet stacks everywhere. Some people pile gorgeous chunky bracelets halfway up their arms (I'm sure everyone is familiar with the stunning Blair and her amazing wrist of jewels) but I'm not one of those people. Maybe it's because I have short little arms and lots of bracelets look silly on me, or maybe it's because no one ever showed up to my parties so big arm parties make me sad (kidding...) but regardless, I tend to wear what I refer to as a dainty arm party. A few little pretty bracelets are all I need. Since Stella & Dot has a collection of dainty feminine bracelets that literally causes me to drool, we thought it would be fun to give on bracelet away to two readers! 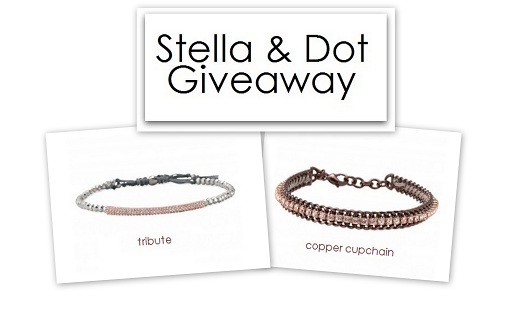 One of you will walk away with the stunning Tribute Bracelet and one of you will walk away with the Copper Cupchain bracelet! Two winners? Now that's a party. Comment on this post and tell me your thoughts on the trendy arm party. That's it! For an extra entry: Head over to my Facebook Page and write on my wall telling me which of these two bracelets is your favourite! For a second extra entry: Tweet the following - "I entered to win a Stella&Dot Bracelet from @missmelissa_k http://www.miss-melissa.com/2012/04/stella-giveaway.html"
Gorgeous! I've been eyeing the copper cupchain bracelet for some time now. Would love to win, as there "ain't no party like an arm party..." Ha! These look great! I love the bracelet trend, as I'm not one for necklaces. I only wear 2 or 3 bracelets and only on 1 arm.. I feel a little like Mr T if I have too much! Fantastic giveaway. nothing dresses up an outfit like some Stella and Dot. I would love to start an arm party and the stella and dot bracelets would be perfect! Thanks for the giveaway! the tribute one is cute!! Would be happy with either, they are both great! They are both gorgeous!!! I lvoe Stella and Dot jewelery! I left a comment on your Facebook page! I'm obsessed with the "arm party." Especially for spring and summer. I'm currently wearing a Fossil rose-gold watch and a bunch of friendship bracelets! I think this arm party is so elegant! Love the tribute bracelet! I love the arm party but have yet to really figure it out ... I get a little crazy if they make too much noise ... thank you so much for a awesome giveaway!! Oh heeey girl well my thoughts are that they're great! I love them, as long as they aren't like crazy, up to the armpit ones. Fingers crossed for the win! I am a fan of the arm party on others, but it just isn't practical for my everyday life... have your tried typing on a keyboard with 10lbs of bracelets on?! The tribute is a perfect bracelet for introducing a arm soiree on a small but classy scale! love it! It looks great and can totally dress up any outfit. I usually only do 2-3 though, because too many can make it look cluttered & too heavy! I love all the arm party pics people post. I had my own arm party of a gold watch, bangles, and pearls last week for a concert and some boy told me my arm made a lot of noise....boys just don't get it. Fabulous giveaway! Love some bracelets!! I so want to get in on the arm party action... But I work at a desk all day and the sound of bracelets hitting my keyboard drives me crazy. Plus I have short little arms like you, and skinny arms, too, so most bracelets just fall off. Sad. Still, I would love to add that copper cupchain bracelet to my collection, it is a stunner! Love arm parties..such a cute trend! I love them both! I need to add more bracelets to my wardrobe! I rock the arm party all the time! I love my big watch with some fun jewels! I agree! Rocking the full stack of bracelets isn't my style but a few key pieces are perfect. I've been following The Man Repeller since the beginning so of course, I love arm parties. I dig a more subtle look for myself though. Very lovely! ... And I just tweeted! I love stacking jewelry and these pieces are stunning! LOVE these bracelets. They make me smile. Diggin' the watch too. I SERIOUSLY love a good arm party. Always! I love the "arm party" bracelet trend, but I only wear two or three bracelets at a time unless they're quite thin. I'd rather be classy than overly flashy (ha I rhymed!). Love those bracelets! Subtle but stunning. They look amazing together! Almost like they were made to wear together. I love Stella & Dot. I had a party for my house warming and everyone loved it! (And I have to ask, did the "Tribute" name come before or after Hunger Games? Thanks for the giveaway! I absolutely love love love an arm party! The more bracelets the better! I love them layered together with your watch in this photo. An arm party? I'm in. The more the merrier, though sometimes I'm worried I'll loose something if I wear too much. I have never really liked bracelets, but they've grown on me - I like mixing thin & dainty bracelets with one or two chunky ones! I haven't gotten into the arm party trend, but I did just pick up a new rose gold and white boyfriend watch that would look amazing next to that Tribute Bracelet. I like any party, arm-party, no-pants party, pre-party party. Love it! I like both the huge and "dainty" army party. These bracelets are so pretty! i love stacked bracelets! I use it to add color and boldness in my accessories when a statement necklace doesn't work with the neckline of the shirt i'm wearing. i love stella and dot. these bracelets are beautiful! Stacking bracelets is a must do. Non negotiable. Mixing metals is the best thing ever! I love it! Can I please wear it to Coachella?? i pretty much love all things stella & dot!!! and i tweeted you! i love both, but the one on the right is so delicate, and sweet...love it! I've really been into the unexpectedly feminine string/wrap bracelets in the chan luu mold. There are some really great diy projects to make braided bracelets using gold hex nuts that I'm loving. I adore your arm party! Love, love, love! I love these bracelets. I espically like the Tribute Bracelet, because it's dainty and has stunning details. Thank you for the give aways! My email is agiesbrecht@hotmail.ca. I love the Tribute bracelet. It would be a perfect addition to my outfit on date night. My email is angel_power51@hotmail.com. I like the Tribute bracelet. It's simply but stunning. It would be perfect for my daughter's birthday gift. My email address is joan_giesbrecht@shaw.ca. I think the arm party is pretty cool! Love a good bracelet... jazzes up any outfit - casual or otherwise! Absolutely LOVE the copper cupchain. Such a great addition to any set of bracelets! Love the arm parties trend, although not sure about the tan lines during the summer! Will have to see if I can still rock it once the sun starts shining again. Love these bracelets, great giveaway! I commented on your facebook! Love S&D! I am a fan of arm swag, but only on days I don't have to type a lot or use my wrists otherwise it just gets in the way. I have had my eye on the Tribute bracelet for a while. Just wrote on your FB page. Looks like a lot of people like the Tribute too! I am obsessed with arm parties and I am constantly looking for new additions to change it up! Left a comment on your Facebook page. Love both the bracelets! Simple and stunning! I love the arm parties! I think sometimes they can get a little crowded, but I love about 4 pieces at a time. Wrote on your wall, and tweeted as well! This comment is for writing on your wall! i love the trendy arm party. it's fun and you can mix and match and not match at all! Love the trendy arm party. I think it looks really pretty. It's one way to dress up a casual look. love those ones! i've lost a few bangles cause of the dainty arm thing, so these are perfect! love the bracelets - simple and classy.beautiful! I'm more of a simple arm, not a party arm, but I could definitely wear these bracelets in a classic way!! I'm a party arm girl but these bracelets are simple and elegant and would make a wonderful addition to anyones collection. Both of these bracelets are cute but my favorite is the copper cupchain. You just brought the fact that I do not own a bracelet to my attention! How is this so!? Such a cute look! Especially with such a cute watch like in the pic! I love the pairing of the bracelets and the watch. I have so many watches and have dealt with the debate of: bracelet or watch? Now there's no debate. Love both bracelets. I love bracelets! I like the arm party trend but I will admit my arm party is a small party with 2 bracelets, 3 if I'm feeling crazy!!! Check out my giveaway for $57 Champagne Roses, Rose Amethyst Brios, 16k Gold Plated CZ's Earrings from designs by Stevie j! I absolutely loooove the Tribute and Copper Cupchain - stunning, classy and timeless.